When Dirk Müller tried to get his No. 66 Ford GT back into race traffic around a blind hairpin on the Long Beach Grand Prix circuit, he caused an honest-to-goodness traffic jam that would be just as plausible on I-5. Müller had been spun around by the No. 911 Porsche 911 just around the hairpin, causing him to block the hairpin’s exit when he tried to move his car out of the way. Oncoming traffic had to slam on the brakes when they were surprised to see the side of the Ford GT just around the blind corner. 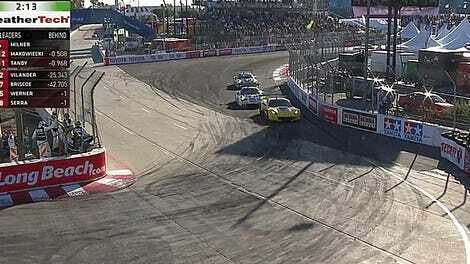 The mess caused the fourth full-course yellow of the race. The No. 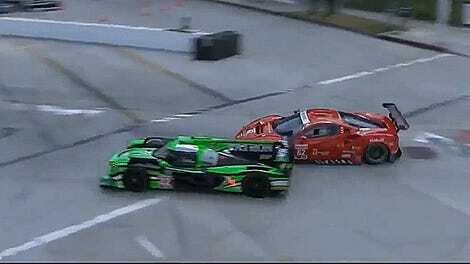 911 Porsche was issued a drive-through penalty for causing the traffic jam, per IMSA. If only we could penalize the half-asleep jabronis who cause the bad traffic jams on our morning commutes, the world might be a better place.